Today I’d like to introduce you to the real hero of my studio - my paintbrushes! I’d have to guess that most artists couldn’t do without them. Yes, we have all heard of artists dumping, squeezing, and scraping paint on the surface of the canvas, but I’d guess that most of the artists out there rely on their trusty paintbrushes to create their artwork. 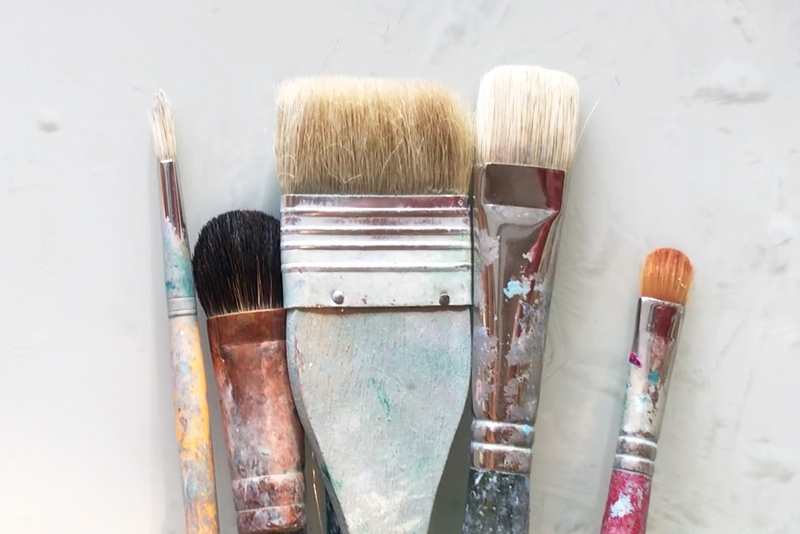 I selected a few of my favorite paintbrushes to cover in my Instagram stories, but I thought it would be helpful to layout all the info here too. There is such a variety of paintbrushes, whether its in shape, in what type of bristles or their specific function. For example, the different shapes of brushes include, Flat, Bright, Filbert, Round, and Fan. Each of these could be maid of hog hair, synthetic fibers, sable (a type of weasel, lol), or ox hair. The different purposes include, but are not limited to detailed work, color washes, hard edges or blending. These lists are by no means exhaustive, and are just the beginning of the breadth of paintbrushes available for artists. In particular, I covered five paintbrushes that I turn to most often. Below, I’m covering each one in detail, and if it’s available, a link so you can purchase one for yourself! 1) Round Brush: A round brush can be characterized by its long, tapered bristles and thin shape. it is excellent for drawing a defined line, or bringing out the details in your painting. I use It to define trees & bushes, and for areas where the light and the land meet. While my paintings certainly don’t fall in the category of “detailed” I grab this brush because the line thickness of the brush stroke is not too thin, not to thick, but just right. Find a similar one here. 2) Fluffy Round Wash Brush: No, this not the technical name of this paintbrush. But, it is the best way I could describe it. I picked up this paintbrush the last time I was in Paris at Sennelier, a legendary art supply store where artists like Monet and Van Gogh shopped for their own art supplies. This brush is super wonderful for covering large areas very quickly. Many of my paintings begin with a thin wash of color before I layer on the landscape details, so this brush helps me do that quickly and efficiently. The bristles are super thin, and luxuriously soft, which helps brush the paint smoothly across the surface of the painting. 3) Hake Brush (pronounced hah-kay): This brush is a GEM. It was on a list of required supplies in my Beginning Painting class at TCU, and it’s been invaluable since. A Hake brush is wide, thin a Japanese brush with soft & fluffy bristles. While it can be used for watercolor washes, I primarily use it as a blending brush. when I have two areas of color on the canvas, I take this brush and use it dry (with nothing on it) and lightly brush & blend the two areas of color together. The fine bristles allow the two colors to seamlessly blend without any visible brushstrokes. This is excellent for creating atmospheric work or even a realistic still-life. It blends paint on the canvas so smoothly and seamlessly, and is a unique tool to add to your kit. I use the 2” one most often! Found the exact one here. 4) Bright Brush: If there was a paintbrush that is my #1, most used, go-to, never fail, this is it. I can paint large areas, I can use it for detail work, and everything in between. Its coarser bristles allow the surface to have some texture when I paint with this brush, and in all honesty, I could finish a painting start to finish with this one. This type of brush is a Bright, which means it has a flat edge with slightly rounded corners. The straight lines it creates are not too harsh, but are certainly defined. I could go on and on, and that can just go to show how much I love this brush. This particular one is a Princeton 5100F Series, size 12. Found a similar one here. 5) Filbert Brush: You might be wondering why the paintbrush-namers decided to call this shape of brush a filbert. I was wondering the same thing. A quick google search revealed that it is named after the filbert (aka hazelnut) nut because it mimics its shape. This brush shape is defined by a curved edge with straight sides. The fine hairs of this particular paintbrush hold a surprising amount of paint. I usually use this brush in the last stages of a painting, when I need to do some detail work or create a highly opaque area. I acquired this brush when I studied abroad in Florence, Italy. I can’t quite find the brand, but there are many similar styles available in art stores! This one is a size 16, but I found a similar one here!